Passing a resolution is one of the core activities CFCI students take on during the school year. 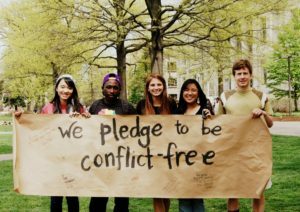 By collaborating with faculty, administrators, and other students at your school, you can work together to draft and ultimately implement a resolution that will commit your school to purchase electronics from companies that are working to source conflict-free minerals from the Democratic Republic of Congo for their products. While changing a policy at your school may seem like a daunting task, there are lots of resources to help you get started. Make sure you read up on the different types of resolutions and choose which one will work best for your school. It is important to note that a CFCI resolution does not ask schools to divest from companies; instead, it encourages your school to become a catalyst for change in Congo by purchasing from companies whose businesses positively impact the region. More information about companies’ minerals sourcing practice will become available via due diligence reports, giving your school the choice to purchase with a cause. Each of the resolution options can have a positive impact and will help encourage electronics companies to source their minerals responsibly, thereby removing incentives and funding and from armed groups and transitioning Congo’s economy towards peace. Sign up now to make your school conflict-free. Not a student but still want to get involved? Click here to learn about making your city or state conflict-free! This is the most powerful step a school can take. It declares that the administration will purchase products from companies that are working to sounds conflict-free minerals from Congo. The school changes its procurement policy for purchasing computers and other electronics. This policy can include committing to buying conflict-free when it is available or prioritizing companies that make a greater effort to trace, audit, and certify their supply chains when picking new electronics vendors. Companies pay significant attention to their contracts with schools, which can range from hundreds of thousands to even millions of dollars each year. A procurement resolution gives schools substantial ability to spark change as companies compete with each other for their business. This option is often the best for a new CFCI chapter or a hesitant administration. Although it does not functionally change anything about the way your school purchases electronics or how they manage their shares, it still sends a strong signal to companies that conflict minerals are an issue that must be addressed. A general statement made by your school can take a variety of forms, but any statement made public by your institution and expressing its support for conflict-free products can have an impact. A general support resolution is essentially a non-financially binding gesture of support or recognition of the overall issue of conflict minerals. While this option falls short of mandating institutional financial responsibility, it is a great first step in a campaign to make your school conflict-free. Schools represent a market for both institutional contracts as well as a highly coveted demographic of young adults for companies, and thus companies will pay attention to the statements of institutions they do business with. Therefore, a public statement on your school’s website will be noticed by companies. A statement also demonstrates the strength and growth of the conflict-free movement, and could place your school in a position to take more action in the future. Schools often hold shares in companies. This means they have significant leverage as managers of large endowments and investment portfolios. Schools can make powerful statements by passing resolutions or policies related to their financial shareholder practices. This resolution commits schools to vote their shares in favor of any shareholder resolution that promotes conflict-free products. In addition, a CFCI campaign can also push for the college or university to actually take the lead and file a shareholder resolution on the issues with any electronics company they are invested in. The option of first your school drafting and filing a shareholder resolution will give companies financial motivation to adopt better policies regarding conflict minerals. It will demonstrate that there are financial rewards and punishments depending on their position. Check out the links below to learn more about resolutions that have already passed and get ideas for how to structure your school’s resolution.